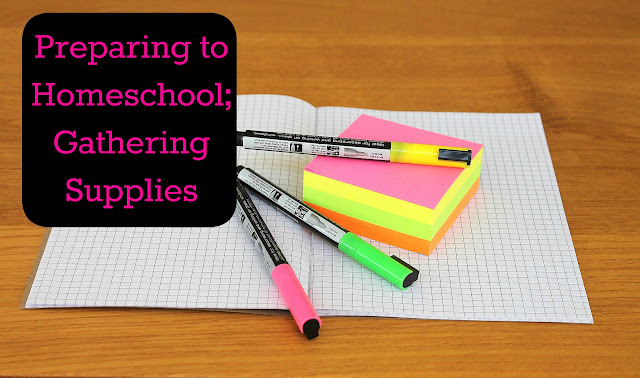 While you don't have to buy a ton of supplies in order to home school, I tend to look for any excuse to shop. I didn't buy a whole lot of stuff before we began homeschooling because I just wasn't sure what we would need and figured I had most of what we truly needed around the house already. That said I've had several ideas in the back of my mind that I wanted to implement once we started. I pulled out all the lists I had made when I was just looking into homeschooling and printed up one master list of all the things I wanted to start ASAP. So, with my list in hand and my two younger boys in tow we started out this morning. We first stopped at our local dollar store, which is a huge treasure trove of household items I thought we had on hand that I found out this week we really didn't. I'm not one to keep and save much of anything, I get into these moods where I systematically clean every closet, drawer, and cupboard in this house and purge anything we haven't used in the last few weeks/months so I was finding my "well stocked" house wasn't so well stocked for homeschooling. I've started saving plastic jugs and water bottles as well as egg cartons but we needed so much more. We bought everything from wax paper, rubber bands, fly swatters, shower curtain liners, and plastic bowls to trapper keepers, lap desks, and notebooks. Here is a small sampling of some of the stuff I bought. One of my biggest purchases is for my all time pet peeve-- the amount of time my kids spend staring at screens. I've started my own little crusade against screens in this house w/ my boys and since our family got into the habit of using screens as a distraction against fighting in the car they are developing a really bad habit of taking their DS's with them everywhere (or else they ask for the portable DVD player and a movie)! I typically wont let them use anything with a screen unless the car ride is over an hour but my husband is much more lenient. I hate it and finally found a wonderful idea in the book Carschooling by Diane Flynn Keith; making up car activity bags. Such a simple, yet wonderful alternative to screens. These bags provide a wonderful way to occupy and teach kids while traveling-- whether to far away places or just down the road. 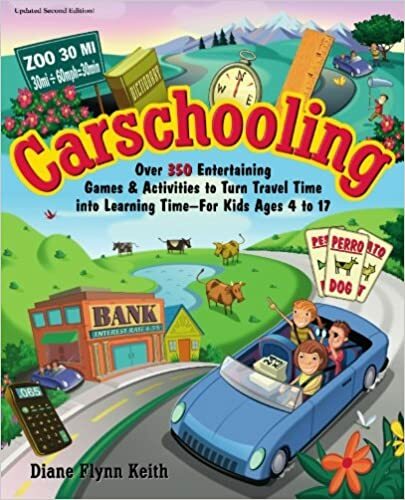 Her book is filled with tons of on- the- go- learning activities, games, science experiments and more; many of which are just a bit too messy for me to feel comfortable implementing in my car. I'm kind of a neat freak and my car is no exception. I have decided to try and branch out allowing my kids to write, draw, and color in the car through the use of their activity bags. I wanted to buy them a lap desk with a clip, that would hold their papers in place, and one that had a lip on the edge to keep writing utensils from rolling off, but since I had them with me and they saw the angry birds lap desk that's what they ended up with. I could have fought it and explained why that wasn't the best choice in lap desks, but I figured if they were excited about it they'd probably use it more often. I bought some clips that I'm hoping to either screw or hot glue into place on the lap desk and they'll have to figure out their own system for keeping writing utensils in place. I also purchased a few pencil sharpeners that would catch the shavings. I'll take several worksheets and activity sheets and put them inside the binder as well; I will put them in the page protectors and the boys will use dry- erase markers so they can use the worksheets over and over again. Hopefully that will keep them busy for many car rides before I have to switch out what they have in the bags. The bulk of the rest of supplies I bought are for upcoming art and science activities. I bought a cheap salad spinner for some spin- art. A few packages of undershirts since the boys had so much fun making t-shirts this week and have asked several times if they can make more--- 7 T's for $9! I bought ice cube trays for holding paint, cheap plastic bowls for making playdoh, putty, flubber, etc & not mixing it in w/ our food. I also bought some fly swatters, tins, tissue paper, coffee filters, shaving cream and shower curtain liners for all sorts of art and learning games that you'll have to tune in to see as the next few weeks go by.